After Center's decision to carve out separate Telangana state from Andhra Pradesh, India, more demand are coming for smaller states in India. After India's Independence, many states were created based on language. That created linguistic division and regionalism. Those people were part of the process responsible for the division in society. Mithila region of Bihar is asking for new state. Though the demand is not very strong till date but one by one new states are forming and it may happen that few local leaders aspire for CM post of future Mithila state. If Mithila state is formed then two different regions - Bhojpur and Magadh will be left in Bihar which can be distinguished. I think in that case lets create one more state called Magadh or Bhojpur so that Mithila, Bhojpur and Magadh can identify themselves with their states. Due to prevalent regionalism in India, political parties use religion, regionalism and other things to divide people of India. For those reasons and others, polarization happen based on those divided line. 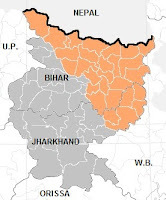 So, lets divide Bihar based on linguistic line so that Bihari can unite as well like many states (Tamil Naidu, Kerala, and Gujarat etc) on the line of Language!